Despite some acknowledgement over the years of the significance of seeing children as rights holders, children’s concerns continue to run the risk of not being considered political and mainstream: they continue to be viewed as extensions of adults or simply as members of families and communities. This when the reality is that children are citizens the minute they are born, and entitled to as much attention, if not more than adults, given their age and vulnerability. Concerned with the mainstreaming of children’s interests in policy-making, this book raises such questions as: What is good governance vis-à-vis children? What are the standards and indicators? Can there be one answer for this question that is applicable to all countries? 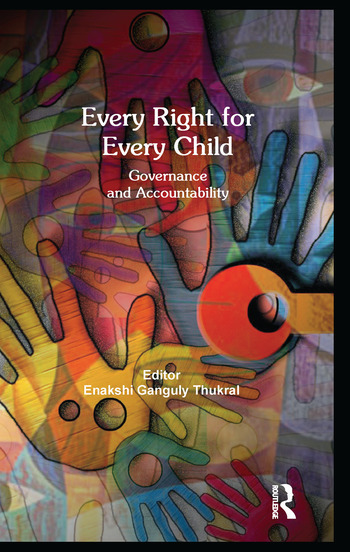 In order to arrive at a better understanding of what good governance for children means and how the realization of the political, cultural, social and civil rights of children may be achieved, the book draws on the diverse and yet comprehensive body of knowledge that has developed over the years from initiatives taken by organisations across the world who work with policy makers to make governance systems more accountable and responsive to the well-being of children as citizens in themselves, simultaneously empowering children to take part in decision-making processes that impact their lives. Enakshi Ganguly Thukral, Co-Director, HAQ: Centre for Child Rights, New Delhi.